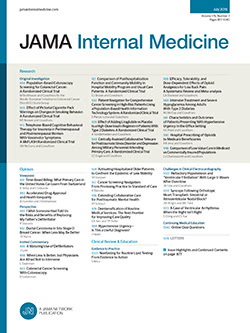 Meta-analyses demonstrate that, compared with no treatment, inpatient smoking cessation pharmacotherapy (SCP) coupled with outpatient follow-up significantly improves quit rates.1 Accordingly, the Joint Commission now considers inpatient use and discharge prescription of SCP as the standard of care.2 Despite the potential benefits of initiating SCP in the hospital,3,4 little is known about its use nationwide, and no estimates exist among patients hospitalized for coronary heart disease (CHD). We conducted a retrospective study of 282 US hospitals that participated in the Premier Alliance database in 2014. All data were deidentified and the institutional review board at Baystate Medical Center determined that the study did not constitute human subjects research. We included active smokers (International Classification of Diseases, Ninth Revision, Clinical Modification [ICD-9-CM] code 305.1) who were admitted with a principal diagnosis of myocardial infarction (410.x) or who received percutaneous coronary intervention (36.06, 36.07, or 36.09) or coronary artery bypass surgery (36.1x.). We examined use of varenicline tartrate, bupropion hydrochloride, and nicotine replacement therapy, including nicotine patch, gum, lozenge, and inhaler. Using hierarchical generalized logistic regression modeling, we identified independent patient and hospital factors associated with receipt of SCP. We used the median OR to quantify the influence of the hospital on a patient’s chance of receiving SCP. Finally, we examined 11-year trends in SCP use. Among 36 675 smokers with CHD (mean [SD] age, 58  y, 69% male, 63% with myocardial infarction), 8316 (22.7%) received at least 1 SCP during the hospitalization. The most common medication was nicotine patch (20.4%) at a median dosage of 21 mg/d. Additional therapies included nicotine gum (0.3%), lozenge (0.04%), and inhaler (0.2%); bupropion (2.2%); and varenicline (0.4%). Patient-level factors most associated with receipt of SCP were chronic lung disease (OR, 1.64; 95% CI, 1.55-1.73), depression (OR, 1.51; 95% CI, 1.40-1.64), and alcohol abuse (OR, 1.71; 95% CI, 1.56-1.87) (Table). There was substantial variation across hospitals, with a median (10th-90th percentile) treatment rate of 22.3% (9.6%-36.7%) (Figure). Accordingly, the hospital was the factor most associated with receipt of SCP (median OR, 1.91; 95% CI, 1.77-2.04), but this association was not explained by the hospital size, urban location, teaching status, or US region. Between 2004 and 2011, there was a 6% absolute increase in mean hospital SCP rate, but only a 2% increase from 2011 and 2014. In this large national sample, we found that few smokers hospitalized for treatment of CHD received SCP during their hospitalization. This percentage increased modestly until 2010 but has slowed recently. Although multiple patient characteristics, comorbidities, and treatment factors were associated with the receipt of SCP, these were outweighed by the hospital where the patient received care. Indeed, 1 hospital achieved an administration rate of 64%, but more than 40% of hospitals administered SCP to fewer than 20% of eligible patients. These findings may reflect differences in hospital policies, physician inexperience with prescribing SCP, or lingering concerns about the safety of SCP in patients with CHD. One limitation of our study is that we did not have information about whether patients were offered and refused medications. Another limitation is that our database may not be fully representative of the United States. In addition, the ICD-9-CM code for tobacco use has high specificity but low sensitivity.5 Although some active smokers could have been missed in our analyses, we are confident that patients included were indeed smokers. Hospitalization for a cardiac event provides a teachable moment with high patient motivation to quit smoking; however, our findings suggest that many hospitals are missing this opportunity to improve outcomes for smokers hospitalized for CHD. We hope these results will encourage physicians and hospital administrators to evaluate local practice patterns and consider quality improvement initiatives6 to provide every smoker the necessary support to quit permanently. Corresponding Author: Quinn R. Pack, MD, MSc, 759 Chestnut St, Springfield, MA 01089 (quinn.packmd@baystatehealth.org). Accepted for Publication: June 7, 2017. Author Contributions: Ms Priya and Dr Pekow had full access to all of the data in the study and takes responsibility for the integrity of the data and the accuracy of the data analysis. Study concept and design: Pack, Lagu, Pekow, Lindenauer. Acquisition, analysis, or interpretation of data: Pack, Priya, Pekow, Lindenauer. Critical revision of the manuscript for important intellectual content: Priya, Lagu, Pekow, Lindenauer. Administrative, technical, or material support: Lagu, Lindenauer. Study supervision: Lagu, Pekow, Lindenauer. Conflict of Interest Disclosures: Dr Rigotti receives royalties from UpToDate for smoking cessation chapters, has received a research grant from Pfizer, and has consulted without honorarium for Pfizer regarding smoking cessation. All other authors report no conflicts of interest. Funding/Support: Dr Pack was supported by award No. KL2TR001063 from the National Center for Advancing Translational Sciences of the National Institutes of Health (NIH). Dr Lagu was supported by award No. K01HL114745 from the National Heart, Lung, and Blood Institute (NHLBI) of the NIH. Dr Rigotti was supported by award No. 1R01HL11821 from the NHLBI of the NIH. Dr Lindenauer was supported by award No. 1K24HL132008 from the NHLBI of the NIH.